“I kind of like when people doubt me and say ‘look for another star,’ ” Markelle Fultz says. 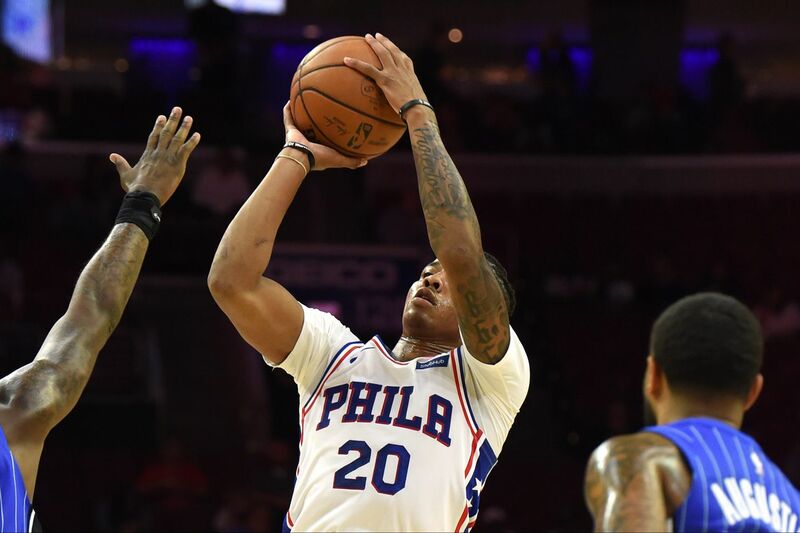 SHANGHAI, China – Markelle Fultz hears the chatter about the 76ers' needing a free-agent superstar to play alongside Ben Simmons and Joel Embiid. "I kind of like when people doubt me and say 'Look for another star,' " he said. "I see myself as that player. I just work every day to become better. "I really don't look at other people's goals [for him], but I definitely look at it to see myself as that next player that can step up in that role." Fultz wants to become the NBA's most improved player this season. Time will tell if he's able to accomplish that. But the 6-foot-4 combo guard has shown some improvement after what was mostly a disastrous rookie season. The Sixers will face the Dallas Mavericks on Friday (7:30 a.m. in Philadelphia) in an NBA China Games matchup here at the Mercedes-Benz Arena. It will mark their third of four preseason games entering the Oct. 16 season opener at Boston. Fultz is averaging 13 points on 11-for-23 shooting (47.8 percent), 3.5 rebounds, 2.5 assists, 2 steals, 1.5 blocks and 2.5 turnovers through two preseason games. He made 1 of 4 three-point attempts in Monday's victory over the Orlando Magic after not attempting a three in the preseason opener. While Fultz's form still needs improvement, the Sixers are elated that he attempted three-pointers. They consider that a start for the 20-year-old, who is trying to get his jump shot back, which enabled him to be the NBA first overall draft pick in 2017. Fultz played in only 17 games last season. He played in the first four regular-season games before being sidelined for the next 68 with what the team called a right-shoulder injury. However, sources said he actually had the "yips," which hindered his outside shooting, and renowned shooting coach Drew Hanlen confirmed that in a podcast this summer. But on media day, Fultz denied he had the "yips." The second-year pro worked on his shot this offseason with Hanlen in Los Angeles. "My goal is to come and help the team in as many ways as I can," Fultz said. "We did pretty good in making it to the playoffs, the second round." The Sixers ended the season by losing in five games to the Boston Celtics in that second-round series. Philly now has a lofty goal of reaching the NBA Finals this season. "So my goal is to come in and help at both ends of the floor," Fultz said. "Being that I'm healthy now, and able to play, I just want to contribute in as many ways as I can." Still, the Sixers had their hearts set on acquiring a high-level player in free agency or via a trade this offseason. Sixers coach Brett Brown said that is required to win an NBA title. The team was unable to lure free-agent targets LeBron James and Paul George to Philadelphia, or trade for Kawhi Leonard from San Antonio before the Spurs shipped the standout to the Toronto Raptors. As a result, the Sixers are determined to get a max-level free agent next summer. As Brown said in May, "the whole notion of the star hunting, star chasing, star development is at the forefront of everything we do." If Fultz has his choice, the Sixers won't need to go outside the organization for a third superstar. "That doesn't surprise me at all," Brown said of Fultz's comments. "He sees the world like that. His self-belief coming out of the summer … and now that he's playing some NBA basketball, albeit not a lot, he thinks like that. He acts like that. He carries himself like that. "To me, most importantly, he's practicing like that. Like he's being it."